At least one person has died in a Park Avenue apartment building collapse following an explosion, NYPD says. Local TV stations report that 11 people suffered minor injuries in the incident in East Harlem. Residents heard a blast in the five-storey building at 116th Street and Park Avenue before it caved in. All train services in and out of Grand Central terminal have been halted following the incident near its tracks. 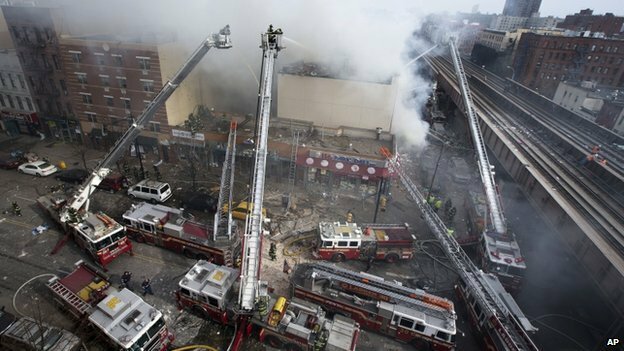 The New York fire department has elevated the incident to the highest threat level possible and dispatched 168 members from more than three dozen nearby fire stations to battle the blaze. The local utility has been called to shut off the gas following the explosion, which damaged windows in the area, reports WABC TV. A witness told the New York Daily News she had smelled gas “for weeks” before the explosion.